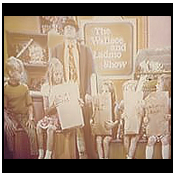 The Wallace & Ladmo Show offered lots of prizes to the audience on a daily basis. 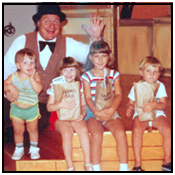 For the first ten years of the show (1954-1964), kids could win prizes in a variety of ways. A large barrel on wheels was brought in containing postcards that the audience had sent in. 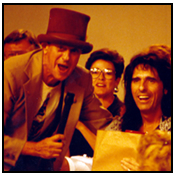 A card was pulled, the name was read, and they were invited down to the show. Drawing contests, Ladmo tie contests and costume contests all provided winners. 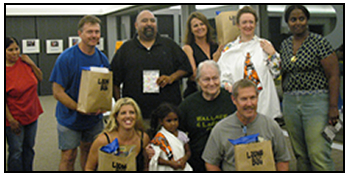 Kids were invited to come on down to the KPHO Studio on 1st Street, be on the show, and pick out their prize. However, all did not always go according to plan. The kids took too long picking out their prizes and it resulted in dead air. So, how did the gang avoid the dead air? 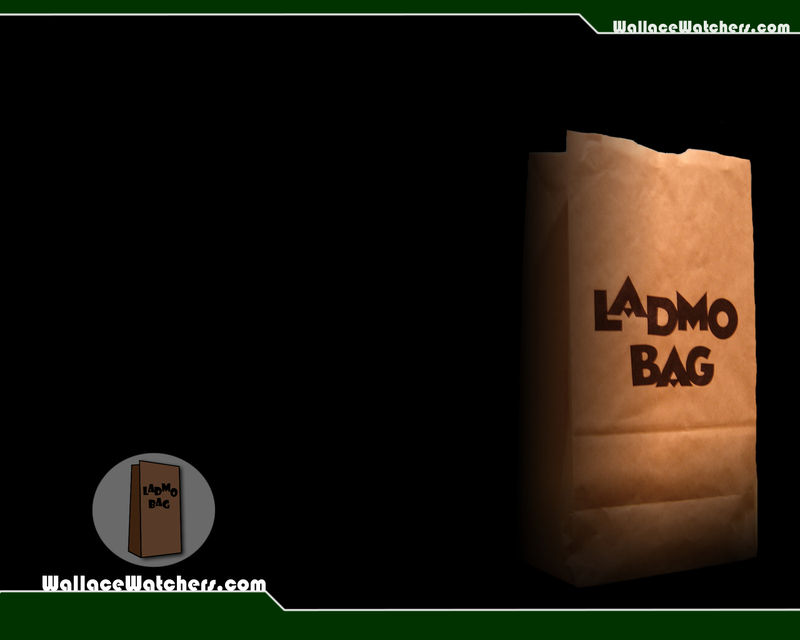 Behold the birth of . . .The Holy Grail of Arizona THE LADMO BAG!!! 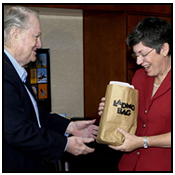 In order to avoid dead air, it was suggested that they stuff all the sponsor's items into a large paper sack and give them away on air. 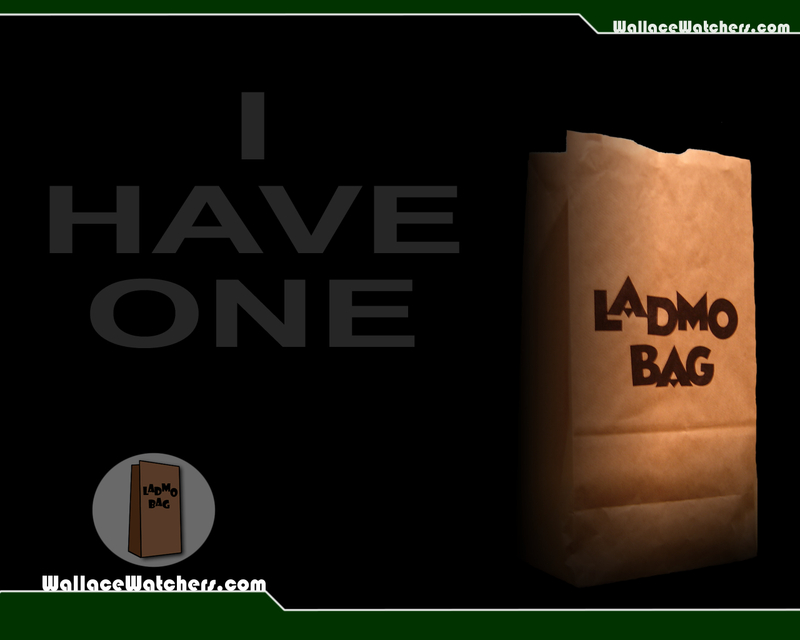 From then on, the entire known universe of creation became separated into those who did, and those who didn’t . . . . win a Ladmo Bag!!!. 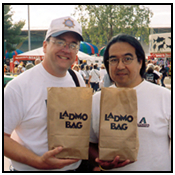 "I won a Ladmo bag as an adult at a toy convention where Wallace and Ladmo were appearing. 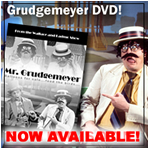 I had the foresight to have it autographed, and never ate anything out of it, or for that matter, even dump it out; it is still packed exactly as they did it! And sealed under glass since the day I got it. One of my most treasured possessions." 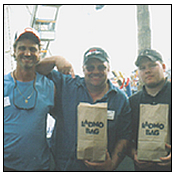 Robin Miller, Kevin Beasley, Cory Beasley at AZ State Fair (2004) - 50th Anniv. Stage Show. 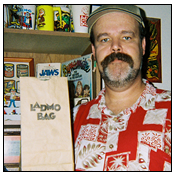 Ladmo came into the art department, probably in 1980. 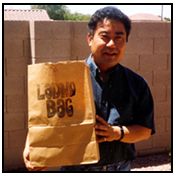 He explained that 7-11 had offered to print thousands of Ladmo bags and asked if the Art Department could create some artwork. 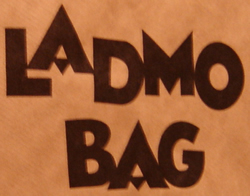 At first we thought to add the KPHO TV5 logo, but the more I thought about it, the more I wanted nothing more than just a plain old sack with some great typography that simple read: LADMO BAG I stayed late one night and cut sample letters from a Letraset catalog (Letraset was a brand of rub down letters that we used quite frequently in the 80s). I found a typeface and decided it could be easily hand drawn if needed. For many years the original artwork, returned by 7-11 after the print job, was stored in the KPHO art department. My recollection was that the type was a combination of borrowed letters from the Letraset catalog and some I drew myself. I was very proud of the design...mostly that I managed to get it by management without having the TV5 logo emblazoned on the front! The year was 1972. 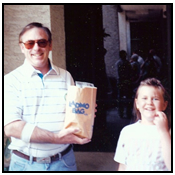 I was an eleven-year old boy in the sixth grade at Cholla Elementary School in Phoenix. A classmate who sat next to me also happened to live right across the street from me. One day during class I sketched a cartoon of Ladmo riding in a futuristic space-looking vehicle which I dubbed the "Ladmo Fun Car." I gave it to him as a gesture of friendship since we were both fans of the show. Imagine my shock when I later discovered that he signed his own name to it, mailed it in to KPHO, and Ladmo, himself, showed in on the air claiming that my friend had drawn it! 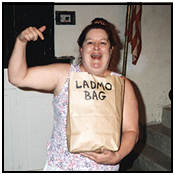 It was only a day or two later when my friend appeared on the show live to receive his prized Ladmo Bag. How he could have lied about the whole thing was just beyond me! I should have exposed him for the fraud that he was, but in the end, I kept silent. I even remember going over to his house and seeing the Holy Grail itself sitting on his kitchen table and he wouldn't even let me look inside it. Is it any wonder that our childhood friendship ceased at that point? Thanks for some incredible, indelible memories. Keep up the good work. Send your photos to WallaceWatchers@hotmail.com and we will post them on the site. 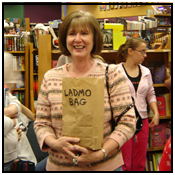 Don't forget to include your name and when/where you got the bag! Or visit us at facebook.com/wallaceandladmo to post your own!